If New Yorkers vote to convene a Constitutional Convention, they then elect 204 delegates (three from each of the 63 state senate districts, plus 15 statewide delegates). Those delegates come up with a slate of ballot initiatives that then go up for a popular vote. Of course, voters can already work to push ballot initiatives without going through the convention process, but doing so through the normal process is a lengthy and burdensome process. The ConCon approach is appealing in that voters have a chance to push through important reforms that would likely never get through the legislature, like ethics reforms and increasing transparency in government. Some organizations see it as an opportunity to take on important issues that elected officials don’t find time to address. The New York State Bar Association, for example, hopes to streamline a convoluted court system and erase barriers to voter registration. It could also be a venue in which to give cities and towns more autonomy from the state government when it comes to very local issues — the New York Times notes in its editorial against the ConCon that New York City cannot even change its own speed limits without state approval. Additionally, while the process for choosing delegates is a political one, it’s possible that those delegates will be less beholden to special interests, since this role won’t requires them to take campaign donations or work for reelection. This could be a chance for other community leaders and advocates to have a direct say in the process. That said, the ConCon is probably not going to be a schoolteacher and a firefighter sitting at a kitchen table and earnestly discussing the issues. The same big-moneyed forces that influence politics today are going to spend their dollars getting their preferred delegates elected and promoting or opposing ballot initiatives. Upstate lawns are blanketed with signs funded largely by labor unions, suggesting that professional lobbying forces will continue to be interested in the ConCon. And while some have suggested that the specter of involvement by wealthy megadonors is merely a scare tactic, we would be naive not to consider the possibility of, say, Robert Mercer writing some checks. There’s also the possibility that the delegates will, frankly, come up with some crazy stuff. In California, where ballot initiatives are a more routine occurrence, voters defeated a proposal to lower the drinking age, an idea that public health experts would call catastrophic. Perhaps there’s no real risk to an out-of-left-field proposal like that, if it never receives enough public support to do damage. Or perhaps the process opens a door for bad ideas to pass through in an environment where they aren’t given serious consideration (Brexit, anyone?). Whether you support or oppose the ConCon ultimately comes down to your appetite for risk. If you’re an organization with a sophisticated government affairs operation, then you feel you already have a handle on the current system and know how to play within it. This category includes unions, advocacy groups, social services agencies, business groups, and many others. It also includes elected officials who may care more about remaining in office than anything else. If you’ve been working on an issue for decades to no avail, then you don’t have much to lose, and the ConCon could be your shot. 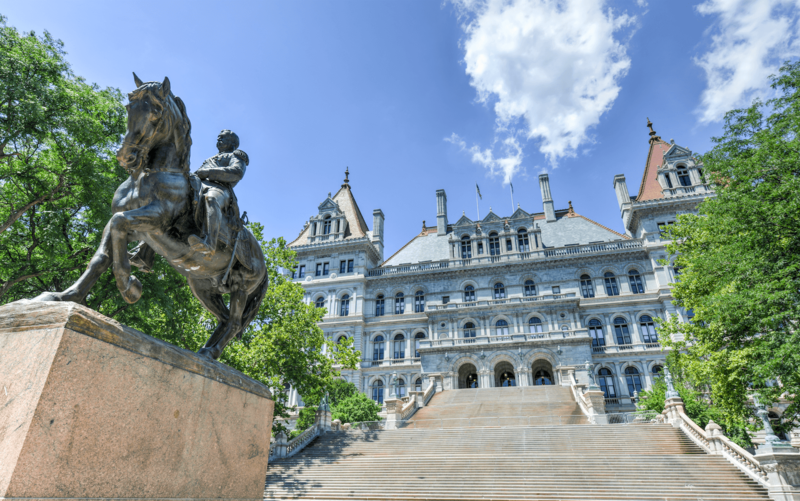 Good government groups like Citizen’s Union, who have been trying to clean up Albany for years, strongly favor a convention (read more about what it may be possible to accomplish in a convention here). The ConCon conversation is full of worthy goals. One important thing to remember is that they are all theoretically achievable through our existing legislative system, a system run by people we elect year after year. If New York voters genuinely care about these issues, they already have the right to lobby, demonstrate, and fundraise intensely enough that their elected officials take action. And if New York voters feel that their elected officials are not taking sufficient action, they have a chance every two years to elect better representatives — or better yet, run for office themselves. And yet, an astounding 98% of incumbents in the state Senate and Assembly are re-elected each term. The bigger issue here is that regardless of what system we’re working with, people need to exercise their citizenship. In the 2016 election, New York ranked 41st in voter turnout — and that was the most contentious presidential election year in recent history. In Rochester, New York, a mere 20% of registered voters showed up to the polls. Interest in state and local races nationwide is staggeringly low, from city halls to statehouses. If people aren’t voting, they likely aren’t writing their representatives, participating in lobby days, or holding house parties for candidates they would rather support. Whether it’s a ConCon or our regular legislative session, we can only solve our problems if we meaningfully engage in the system. We have ample opportunities for civic action, but few of us take them. New Yorkers, it’s time to organize and vote like we mean it.